Chevy Bolt - Top 10 Questions Answered! - All You Wanted to Know! 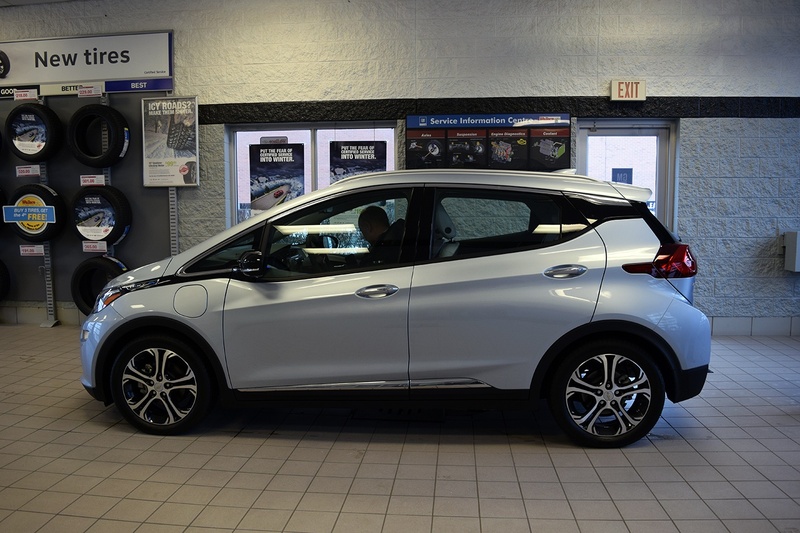 Unlike the Chevrolet Volt, the all-electric Bolt runs solely on batteries! The all-electric Chevy Bolt EV is weeks away from arriving in Canada, and we’ve been asked all sorts of questions. 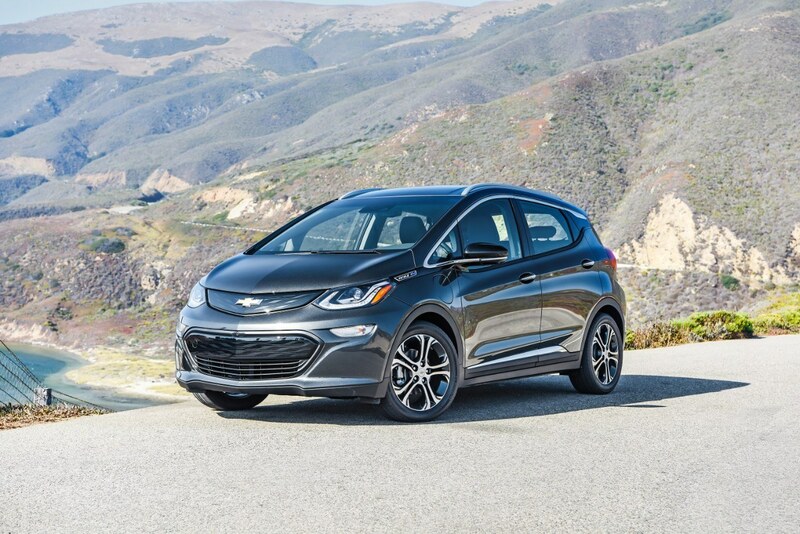 Here are the top ten questions we’ve received about the new Chevrolet Bolt! 1) Volt? Bolt? What’s the difference? Unlike the Volt, the all-electric Chevy Bolt does not feature a gas or supplementary engine of any kind. 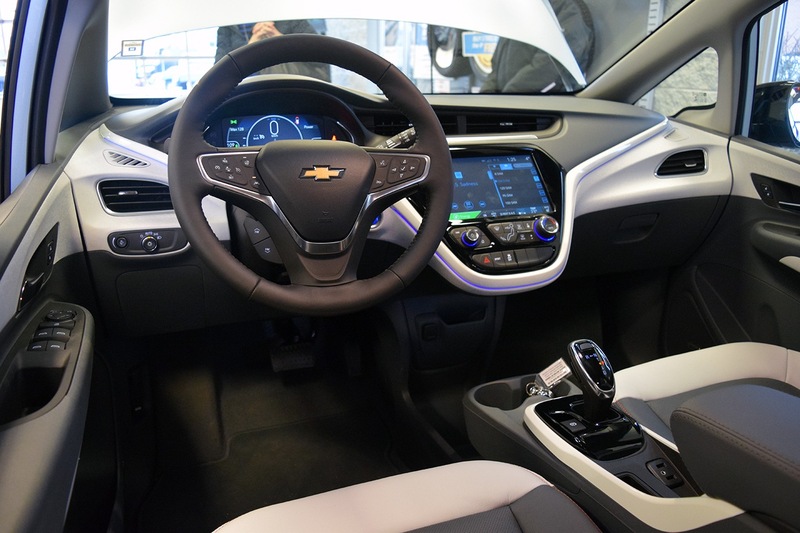 The Volt uses a small 1.3L engine to power an electric generator, which charges up the battery. 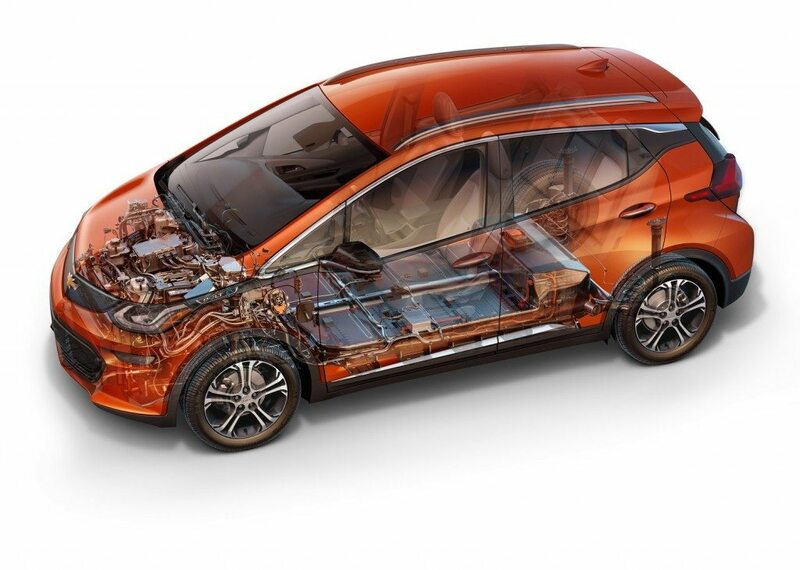 However, the Bolt does not feature an engine of any kind- only batteries! Fully charged, the Bolt will travel an EPA-certified 383 kms. It should be noted that several journalists who tested the Bolt actually drove further than the estimated 383kms. However, it should also be noted the Bolt is actually more efficient in the city, unlike most vehicles with gas/diesel engines. Drivers use their brakes more frequently in the city, which provides the vehicle with more opportunity to use regenerative braking. 3) How long does it take to charge? Like your cell phone, charging depends on what type of charger you are using and how full the battery is when you plug it in! Chage times very drastically based on the three types of chargers. Level I charger (120v outlet): Charging takes a while due to the low voltage. This is best used to charge overnight. Expect a full charge (0% battery to 100%) in about 12+ hours. Level II charger (240v outlet): You can expect 40 kms of range in 1 hour. Expect a full charge in about 9.5 hours! Level III charger (480v outlet/DC Fast Charger): You can expect 145kms of range in 30 mins. By that account, you can expect a full charge in about 2.5 hours. 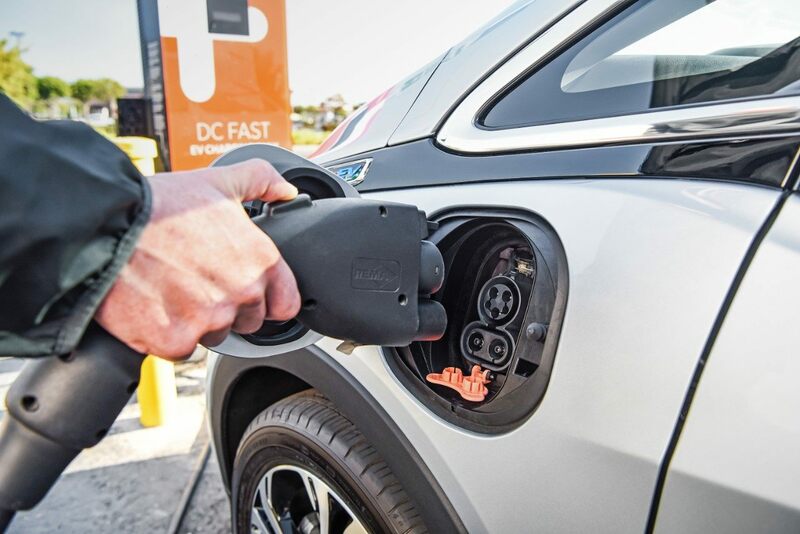 The Government of Ontario offers a rebate on Level II chargers?! Click here for all the details on Ontario’s EV Charging Incentive Program! *This is a pre-tax equivelant of the expected Ontario Provincial EV Inventive of $12,839 on the base model of the Bolt EV. 5) When does it arrive in Canada? The very first Chevy Bolt EVs will arrive on dealer lots sometimes in late February/early March of 2017. Most of these vehicles have already been sold, and volume will be very limited in the first year. Many Chevrolet dealers across North America have received far more orders than can be filled- demand has far outstripped supply! 6) Can I order one, or at least put by name down on the order list? YES!!! While current supply is limited orders are filled on a first come basis – the sooner you order the sooner you will receive your vehicle! Give us a call at 1-888-878-2354 or send an email to dsinger@wallacechev.com to find out more about wait times or even put your name down! To get in contact with a Wallace Chev representative and talk more about the Bolt, click here. 7) Where can I find a list of charge stations in my area?The location of every charge station, along with the type of charger at that location, can be found on this handy charge map! Now you can even plan long trips and journeys with your Bolt EV! 8) What does it cost maintain? Will it be cheaper than a gasoline-powered vehicle? With no engine to account for the Bolt EV is far LESS expensive to keep on the road! 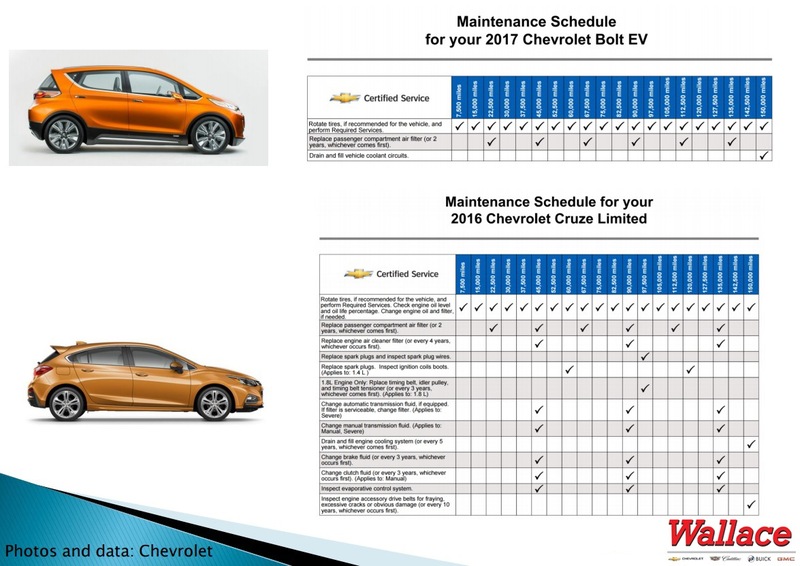 According to the Chevy Bolt owner’s manual, you can expect tire rotations every 12,000kms, cabin air filter replacements every 36,000kms, and a coolant flush every 240,000kms. Chevy also recommends a brake fluid replacement every 5 years, regardless of mileage. And that’s pretty much it! No oil change, no gas…and a whole lot less to break! 9) What kind of features & trim levels can I expect? The Bolt is available in two trims: LT and Premier. Even in base (LT) trim, you can expect tons of sweet features and new technology specifically designed to provide you with detailed driving updates and efficiency read outs. LT models feature Regen on Demand steering wheel paddles, rear vision camera, 10.2-inch diagonal colour touch-screen, Michelin self-sealing tires, Apple CarPlay/Android Auto, and more! Premier models feature includes all LT equipment plus additional features like leather-appointed seats, front & rear heated seats, surround-view camera, rear camera mirror and more! 10) What sort of colours are there?